Well...we are all home safe and sound but we left a part of our hearts in Vicosa. Here is a brief run down of our last couple of days. On Friday, we had a great time with the students. We had class in the morning and then spent the afternoon packing and preparing for our departure. Friday night, Sue had planned to make homemade pizza for us. We had gone to the grocery store and tried to find the ingredients she needed. She prepared the dough and let it rise. It then needed to be put into the oven to brown. To our surprise, we had run out of gas. The tanks were empty. So we had six pizza crusts ready to go and no way to cook them. Robson called the gas man and to our surprise (after two calls) they delivered gas on a Friday night by motorcycle! The pizza was finished and it was a hit. After dinner, it was ‘tissue time’. The students had worked on a video montage for us....for the ‘Wonderful Women’ as they affectionately called us. It was a whirlwind of emotions going from crying, one moment, as the reality of our leaving took hold, and in the next moment, we would be hysterically laughing as we remembered some of our more humorous moments. On Saturday morning we treated the students to an American style breakfast. Again, Sue gifted us with her baking talents and she made cinnamon rolls from scratch (it was an adventure in itself just to figure out what yeast and cinnamon was called here). I made pancakes complete with maple syrup (thanks to Aunt Jemima and Log Cabin brought all the way from the US) and chocolate chip pancakes with powdered sugar (also imported from the US). The students were thrilled...and to be perfectly honest, the US team enjoyed having a taste of home as well. On Saturday afternoon we went to the city to so some shopping and then it was time to come back to the house and get ready or graduation. Because the team was taking the overnight bus back to Rio we had to be completely packed before we left for the ceremony. The graduation was held at CEM, the missionary training school that we partnered with to provide this immersion experience. We started with worship, led by the students. Then, Robson spoke. It was beautiful. He talked for 15–20 minutes, all in English. He talked about how the program had helped him with his English but more than that how God had used it to change his life. He finished with showing the video so those at the graduation could get a feel for not only what our last two weeks were like but what the entire program was like. I was able to share what a privilege it had been for us to be a part of the this program...that I was not there only representing Team Three, but Team One , Team Two and Living Word. The students received their certificates, an English Bible and then we had a time of brief time of fellowship. Afterwards it was time to go back to the house, load the van with all the luggage and go to the bus station. That meant the last goodbye for the team and four of the students. I can’t adequately explain what this is like. I know it seems impossible that after two short weeks you could build the kind of relationships that make it that difficult and painful to leave but it happens. I think it is the combination of living in community and the fact that we all share a passion for our God. The bonding is close and saying goodbye, knowing that most likely we will never see each other again this side of heaven, is very emotional. We went to bus station accompanied by three of the students that would be traveling with us to Rio to catch their flights to Central American and two students who would be going back to house. So...another long goodbye ensued. Shortly after 11 pm we were on our way. Some cried quietly in their seats hoping that sleep would soon overtake them. It was especially hard on the three gals traveling with us as they were saying goodbye to their housemates of six weeks. After a long might of traveling, we arrived at the Rio de Janeiro airport at 6:30 am. We found a little place to hang out...11 of us with 15 pieces of luggage. And so began our 16 ½ hour wait for our overnight flight. The time passed easily as we played games, shopped and ate (plus our mini showers in the bathrooms). At 7 pm, we said yet another goodbye as Irene and Cristy left for Guatemala and Carol left for Mexico. The US team boarded at 11:00pm and landed in Atlanta at 8 am where we had one more difficult goodbye. Sue was leaving us she was flying back to Detroit (she arrived later than planned as she gave up her seat to a military man who had not been home in two years!) The rest of the team left Atlanta and landed in BWI at noon. No delays, no lost luggage. We had a wonderful trip, a wonderful program and are excited to see what God will do with EnglishBridge in the future. The program has come to be so much more than just a format to teach English. For some reason God has used it to intervene and change the hearts of those who allow Him to do whatever He wishes in their lives. I have witnessed amazing transformations in both the students and the teams. It is an amazing, beautiful combination of language learning, community and spiritual transformation. It has been one of the most amazing experiences of my live to be involved in this program. And, let me take this opportunity to say what a wonderful team I had. The ‘Wonderful Women’ were truly that. Thank you for trusting me to lead you on this journey. I know that the time was very meaningful for some of you as God stirred some things up. I encourage you to continue the work He has started. So, it is with joy and sadness that I close this chapter of EnglishBridge. I look forward with anticipation to what God will continue to do in and through this program. Thank you for joining us. This is what Jenn calls her class every morning…”My Beautiful Students”. And that is what they are. Let me give you a thumbnail sketch of the incredible people we have shared a house with over the last two weeks. There is ‘the couple’…Aline and Robson. Aline is a quiet, beautiful young woman who has become the ‘mother’ of the group. This is unusual because she is not the oldest but because she is part of a married couple who have taken on a parental role, in the best of ways. She and Robson are both from Brazil and feel God calling them to either Indonesia or Myanmar. Aline prefers one on one conversations to loud group games. She LOVES movies and if she had her way, every night would be a movie night. She is a natural caretaker. Robson is gifted. He is an artist and he is naturally curious. He is the one who always has a question, who always wants to know more. He has a very gentle nature but also a very sharp wit and can make you bust out laughing at a moments’ notice. He has served the team as an interpreter when we go to town or need to do something that would be very difficult for us English speakers…like buy tickets in the bus station. He loves God and has a deep desire to serve. Daniel is from Chile. He is also talented. He plays guitar by ear. He has often played for us during our breaks and his range can be anything from Bruce Springsteen to an impromptu tango. He has given us many occasions of side splitting laughter as he is also a natural comedienne. He has impressed us with how much of a gentleman he is. “Ladies first” is an expression we hear at mealtime, when walking through doors, etc. When we are in town he keeps a watchful eye on all us and is concerned for our safety. He senses God calling him to work with Muslims. He plans to leave Chile in October to begin his work in the Middle East. He jokes about having five wives there but then we reminded him that with five wives comes with five mother-in-laws. He has decided that one wife is more than enough. Irene is a nurse by trade. She lives in Guatemala. Her nickname is ‘Baby’. She is the tiniest of the group but there is nothing tiny about her love for God. She is very quiet but surprised us all by her performance in the Little Red Hen. She had the lead part and really put herself into the role. She will occasionally come up with a saying like “I have my limits” and we will all look at her and say, “Where did you learn that?” She feels God asking her to serve in India. Carolina is from Mexico. She is a natural leader. 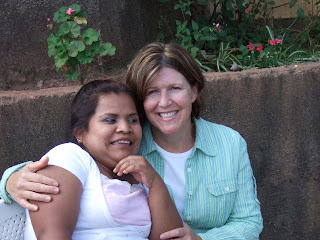 Through her conversion some years ago, each of her family members has come to Jesus. She has a fascinating testimony. She is very competitive at games and also very talkative. She became our weatherwoman. I would ask her is the sun would be shining today…she would look outside and ‘not yet’. She, too, feels called to India. Cristy is also from Guatemala. She is a petite girl who is a loves to dress nicely! We have been envious of her clothing. She has an incredible grasp of English. She studies hard and writes beautiful letters to the team. Her pastor and church are very supportive of her and proud of her decision to follow God’s calling. Her desire is to go to India and minister to Muslim women. Fabiana is from Brazil. She is a very gifted debater. During our debate time, she looked and sounded like a seasoned lawyer. She is very articulate and can certainly hold her own in any conversation. Fabi believes God is calling her to Tunisia. Finally, last but not least, is Ricardo, who is also from Brazil. He is a wonderful musician. He is a husband and a father. He only was with us for five weeks but he left an impression. He is trying to get a visa so he can come and study in the states. He has been accepted to a university in Texas to study classical music composition. That is just the tip of the iceberg regarding the students. They are awesome people who have each left their imprint on this team and the teams before us. We had our last official class session this morning. We have spent the afternoon hanging out and packing. Tonight we have a special treat as Sue makes homemade pizzas and tomorrow morning we will surprise them with a breakfast of homemade cinnamon rolls (again, compliments of Sue ) and pancakes and maple syrup. Then we will go into the city to do some shopping and tomorrow night is our graduation. After graduation we will be boarding the overnight bus to Rio. 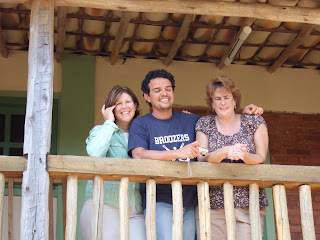 Three of the students will travel with us…Irene, Caro and Cristy. The rest will leave Sunday morning (when they found out when we were leaving Saturday night instead of Sunday, they tried to get their tickets changed to leave in the evening as well, because they said it would be too sad to wake up in the house without us). I will try to blog tomorrow but it may be too busy. If I do not get a chance to do so before we leave, we ask for your prayers for safe travel home for both the students and the team. I will blog again, either here or once home to give the details of the end of our adventure. Please know that the students and the team have felt and greatly appreciate your prayers for the program. It has been a wonderful 6 week experience. Thank you for the great work done by Team One and Team Two to get the ball rolling and to Team Three for finishing well. And, thank you for support of all the team member’s families as well as though who supported us financially. It’s a long one so go get a cup of coffee and settle in. There is so much more happening here than teaching and learning English. We are building relationships and learning about each other’s culture. We are sharing stories and playing games. But, I think the most significant thing that is happening is what God is doing. Every morning we have worship and a devotional. Yesterday, a team member gave her testimony. It was intense and emotional but it is a testament to what God has done in her life in the last two years. One of the students was able to respond to some healing that God wanted to begin in her. It was a powerful day. We were all exhausted afterwards but it is the most important thing that happens here. There have also been some significant things that have happened in the lives of the team as well. This is truly what it is all about. Later in the afternoon, we went downtown as a group. It was a beautiful day. We had fruit smoothies at a juice bar, did a little shopping, went to the grocery store (one of the students is making tortillas for us tonight and Sue is making pizza for us tomorrow night) and then we had to go and buy our bus tickets back to Rio. 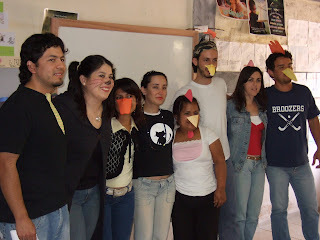 Today in class, Jenn had students and language helpers do an exercise designed to help them appreciate their senses. One partner was blindfolded, had cotton put in their ears, had their thumbs taped down and had pebbles stuck in their shoes. The other partner walked them around the yard and the house. Afterwards, they talked about the experiences and discussed how it gave them a new sensitivity for people who struggle with disabilities and how it was an exercise in trust. Let me take a moments and talk about the language helpers. This has been a phenomenal team. I’ll start with Deb S because her husband Jack has been waiting for something to be written specifically about her (so this is just for you, Jack!). Deb has been such a gift to this team. Not many of us knew her before the trip but are so blessed to have begun a relationship with her. She has been leading our large group games, which have been a hoot and everyone has loved them. The other day she had us unwrapping Hershey Kisses with our feet! Lisa is such a sweet person. Her gentleness has made her a safe person to be with for both the students and the team. The students gravitate to her. As a team member, she is willing to do whatever is asked. She has learned a great deal about herself on this trip but that is her story to tell. Alice has been a surprise blessing on this trip. I knew her to be deeply spiritual and gentle and assumed she would bring those attributes to the trip but she is also a beautician and she brought her beauty supplies with her! She colored and cut the students hair, plucked the cook’s eyebrows and did one team member’s hair TWO times (who shall remain unnamed). Everyone looks lovelier because of Alice sharing her gift. Pam is a musician. She plays flute. She felt God ask her to bring it along, which she did but she didn’t tell anyone. During our first worship service she played for us. We are all so glad she listened to God because she has gifted us with her playing. This is in addition to her kind, loving way of being with others. I didn’t know Jeanne before this trip. She is an incredible artist. She has been doing portraits of the students and also helped with some of the drawing we needed to do for class. She has learned a great deal about herself on this trip and I think God will continue this work once she is home. Sue is our team member from Michigan. I have known her the longest. She is a ‘doer’. She has spent countless hours drawing (we have all benefited from this hidden talent of hers) and helping Jenn with whatever she needs. We would have been struggling to have visuals for the students without her gifts. She also sees where God has been at work in her life during the last two weeks. Then there is Jenn. Jenn went to Argentina two years ago as a language helper. She had one of the most dramatic transformations I have ever witnessed on a trip. She continued that work once she returned home. Now, she has come along as the teacher on this team and has done an outstanding job. She is fun and she is innovative. We never know to expect when Jenn is in front of the class. The students love her and they have learned so much. She continues to see how God is working in her life, knowing that transformation is an on-going process. It has been a joy and a pleasure to serve with this group of women. I appreciate what each of them has brought to the team and to my life. Tomorrow, I will share about the students. Again, thanks for all your thoughts and prayers! Today’s post will be brief. Just thought I would share some of our crazier moments. It is not easy to upload pictures as we are using dial up but I have posted two photos. 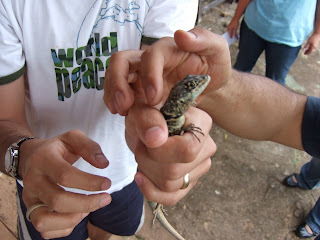 Two days ago, the guys caught a lizard for us to see up close. The poor lizard was probably scared out of his mind. Before letting him go, the guys ‘hypnotized’ him and posed him on a beach chair. I’m sure it was an embarrassment he will never live down with his other lizard friends. And just so you know…no animals were harmed during the taking of these photos. 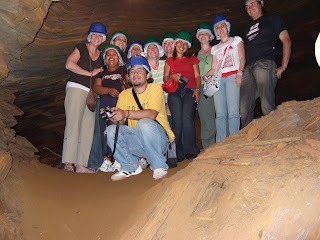 The other was taken of some of us while we in the gold mine in Ouro Preto. We look lovely in our hair nets and hard hats….don’t you think? Tomorrow I will write a longer post and catch you up on what’s happening as we wind down our stay. Deb and the rest of the team. Relationships continue to deepen and given that we are almost in the middle of our last week, I encouraged the team and the students to ‘finish well’. There is a tendency this far into the program for the students to become tired and lose momentum. Both the students and the team can also begin to disengage, as a way to protect themselves, as they anticipate saying goodbye for the final time. This morning, I urged them to remain open with each other because I feel that God has something special for us in our final days together and also in the pain we will feel as we say goodbye. If you’ve never been on a missions trip before or even if you have, it may be hard for you to understand why it has been so difficult for the teams and the students to say goodbye. The setting for this trip is so different. Each team has spent two weeks living in community with these students….eating together, learning together, playing together, laughing together, crying together, worshipping together. We have shared parts of our lives with each other…hopes, fears, joys and hurts. It may be hard for you to believe, but we love each other. I will truly miss Daniel, Robson, Aline, Carol, Irene, Cristy, and Fabi. Each of them brought something different, something unique into my life. God does extraordinary things on this type of trip. Bonding happens quickly and just continues to deepen. We will not just be saying goodbye to a group of students this weekend but to new friends who we know, we, most likely, will not see again this side of heaven. And…not only have we impacted them…they have deeply impacted us. They have touched our lives, teaching us what it is like to respond to a call and give up everything to be available to God. We are in awe of them and of what God is doing in them and we are so thankful he has allowed us to be a tiny part of that work. Our trip to Ouro Preto was fantastic. It is a gorgeous town with hills reminiscent of San Francisco. There is very little level ground there. We toured some churches and museums as well as an old gold mine. It was a good way to allow the students to provide translation for us. We had a very nice worship service yesterday and then spent the rest of the day hanging out. This morning, it was back to work. We are beginning the last week of the program. Team Three has taken on a personality all its own, as did the other two teams. There are sayings and expressions that have taken hold. A couple of ours are “To the Batcave!” That means it is time to get back to class. If some of the students are lingering behind, you’ll hear one of them yell, “Get the lead out!”. Then there are some hanging on from other teams…one we hear often is “Run Forrest, run!”. For better or worse they are picking up American English slang. It’s a trip to hear them try to use some of it in conversation. There are two unique things Jenn has brought to the classroom. One is a mailbox. All of the students and team’s names and addresses are written on index cards on the wall. Each person takes a different card everyday and writes a letter to that individual. They then have to address the envelope correctly and put it in the mailbox. Daily, at 1 pm, there is mail delivery. Everyone looks forward to it. It has been a great way for the students to practice their reading and writing skills. The other thing she began just today was debating. Someone was accused of a crime and the students were split into two groups. With the help of their language helpers (who were only guides…the students did the debating) the students had to present their case. One group argued that the defendant should get the death penalty and one that she should not. We were all surprised at the depth of their arguments and at their confidence and ability to speak and debate with each other. We will be doing these every day this week. Sometimes, there are mild misunderstandings because of accents. Here is a recent example. Words were spoken that drove fear into my heart….Daniel said “I found a spider in my room.” Early in our stay here I asked one of the students if he had seen any spiders here (to prepare myself). He said that in all the time he had been in this house he had never seen a spider. I slept well after that conversation. But last night…it was a different story. After Daniel announced there was a spider in his bed, he grabbed a jar to go down and catch it. Two of the gals, Irene and Cristy went down with him. They came back up first and said it was a tiny spider. I felt some relief. Then Daniel brought it up in the jar. Holy smokes….it was a huge wolf spider (I think). UGH!!!! I knew then that there were some sleepless nights in my future. This morning, wondering if he had a bad night, I asked Daniel if he saw any more spiders last night. He said, “No…just a lisa and I chased her out of room.” There is a Lisa on our team. Now I know Lisa and I know there was no reason for her to be in his room…then it dawned on me that he was saying lizard…not Lisa. There was a lizard in his room. We all have stories like these. Then there is the serious side of things. One of the students revealed yesterday that her siblings had made fun of her as a child and that she knows she now protects herself and does not talk about her feelings. She said the program has helped her begin to do this and she knows it is good for her future ministry. A team member has realized that God brought her all the way to Brazil to break through some of her walls of protection as well. This is the thing I love most about these trips…the way God works in each person, molding them into who He wants them to be. The interior work here seems accelerated because all the things we used to define ourselves or create security are stripped from us and we are left unguarded and vulnerable. You will see some people close off as best they can and others who yield to what God is doing. It is beautiful to witness. And in closing, I want to share one students’ story with you. Her name is Cristy. She is a petite little thing from Guatemala. Her desire is to go to India and work with Muslim women. She loves giving manicures and massages and her plan is to work in a gym in New Delhi that caters to Muslim women. She will provide those services and while doing so, begin to build relationships. Although she knows going to India, as a single woman, is a hard life, she has a heart for the women there who do not know about Jesus. Ok...enough for today. Thanks for joining us on this incredible journey. A short blog today, as we are leaving for Ouro Preto. This is the same city that Team One went to. We were concerned that since the students had already been there they wouldn’t want to go back but they are very excited to show us around. It is a good break from the normal routine and a great way for them to practice their English as they translate for us. But, before we go I want to tell you about yesterday. The students did one of their famous drama performances. This time is was the Little Red Hen. What a treat! They practiced their lines, made costumes and even wrote and performed original music! It was fantastic. Pictures do not do it justice but it is the best I can do for now. We also played a rousing game of Jeopardy. The students are very, very competitive but also very forgiving. Just for those of you who need all the information…the girls won! :0) The guys really struggled with the category “Jewelry”. One said ‘collar’ for necklace. It was hilarious. You can only imagine how many times we laughed. Who knew learning could be so much fun. Ok…that’s all for now. I will write more on Sunday. Welcome to the blog for EnglishBridge. EnglishBridge is an English immersion program, designed to teach English to Latino missionary candidates. 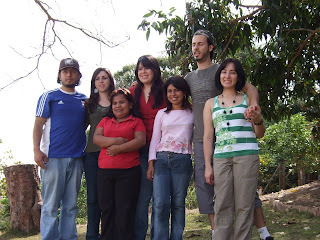 The students learn the English language in the context of community and relationship. 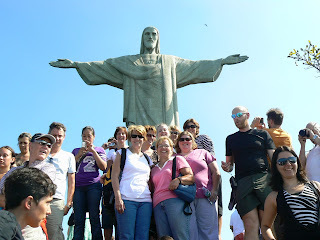 24 North Americans from Pennsylvania and Michigan will travel to Vicosa, Brazil. The first team leaves Living Word Community Church on Friday, June 27 to run the first two weeks of the program. We invite you to take part in the journey by reading about how the program is going. Our team will try to blog every day to let you know how they are doing, and what God is doing in their midst. Thank you for being part of what God is doing in Brazil, in the lives of both the students and the team members.